Is It Okay to Leave a Few Small Crickets in My Lizard's Cage? While it causes no harm to leave vegetables in your lizards cage for a day or more, you cannot allow feeder insects to roam the cage freely. Crickets -- or other insects -- left in the cage may nibble on your lizard, spread pathogens and elevate your pet’s stress level. Instead, feed your lizard as many crickets as he can eat in a feeding, and remove uneaten crickets immediately afterwards. It won’t take long for crickets left in the cage to get hungry and begin looking for food. Crickets are omnivorous insects with biting mouthparts; if they cannot find anything suitable to eat, they will turn to your lizard for sustenance. 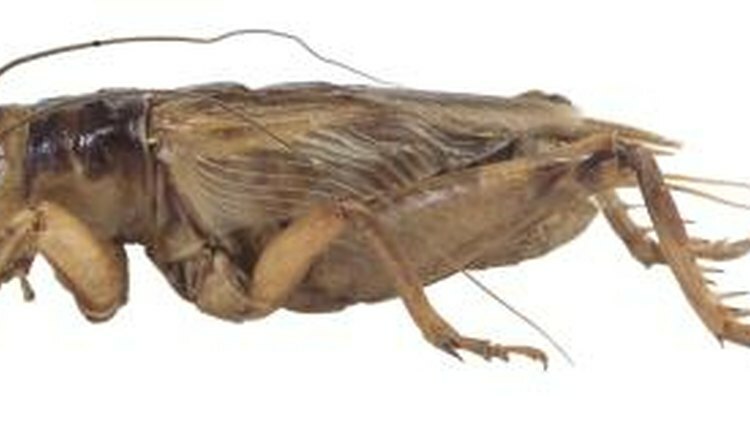 Typically, the tail tips, toes and eyelids are the areas that crickets attack first. These wounds are undoubtedly painful for the lizard, and can be an entry point for bacteria and other pathogens. While the crickets are moving around the cage they collect bacteria on their bodies; they can spread this bacteria to your lizard’s food, water bowl and body. Additionally, crickets will consume your lizard’s droppings, which may have parasite eggs in them. If your lizard then eats the crickets, his parasite load can increase drastically. Your lizard is sure to become stressed if crickets or other insects crawl on him. While a single cricket crawling across your lizard’s back will not cause great stress -- he will usually elect to flick it off or eat it -- several crickets may overwhelm him. When this happens, he may simply close his eyes and try to endure the insects. This causes great stress, and if the crickets begin chewing on him, it can have further consequences. Always supply feeder insects with a high-quality grain and vegetable-based diet prior to offering them to your lizard. Dust your crickets with a vitamin and mineral supplement on a schedule appropriate for his age and species. Offer a few crickets to your lizard at a time; when those are gone, add a few more. Repeat this pattern until he has dined on an appropriate amount of crickets. With experience, you can maximize the amount of crickets you can add to the cage at a time by learning how many he can catch before they run and hide. If your lizard is sufficiently large, you can place crickets in his food bowl. A good practice is to check your lizard’s cage each night about 30 minutes after the lights go off and remove any crickets seen. What Is the Proper Humidity for Bearded Dragons? What Does It Mean When Geckos Puff Out Their Jowls? When Geckos Shed, Does It Affect Their Appetite? What Can I Do to Help My Gecko Shed?